The circus has been opened up to all sorts of party animals, and the zebras aren't about to let anyone show them up. Click here to play! Join the rampaging mania that is Zany Zebra today, and enjoy some wonderful cash winnings while you are at it. 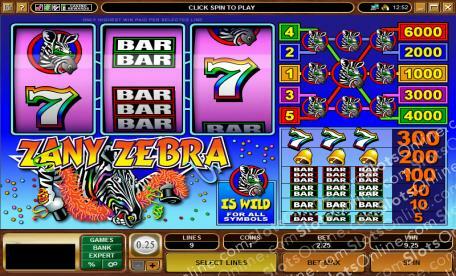 Zany Zebra is a 3-reel slot played across 5 pay lines. Opening up more lines will allow for more combos, while playing up to 5 coins will increase the maximum payout on jackpot wins. The Zebra logo is Wild and can be substituted for any other symbol on the reels in order to complete a winning combination. Depending on how many coins you choose to play, you will be paid out on triple Zebras accordingly. For example, if you only play one coin and spin up the jackpot on pay line one, you will receive 1000 coins. However, if you play all five coins and spin the jackpot on pay line five, you will take home 6000 times your initial bet. Join the crazy crew today in Zany Zebra! Zebras are Wild and can be subbed for every other symbol to finish winning combinations. Payouts can reach up to 6000 coins per spin.